Part Of Highly Anticipated ‘Its That Easy’ Campaign, Comedic Spot Highlights New Business Ventures From Retired Football Greats Brett Farve, Franco Harris, Emmitt Smith, Terrell Owens and more with a collection of great 2015 Super Bowl teaser ads. Retirement is never an easy play for most professional athletes, but for ones with an entrepreneurial spirit like Brett Favre, Terrell Owens, Larry Allen, Franco Harris and Emmitt Smith it’s as exciting as their days on the gridiron. That’s the message behind web development platform Wix.com’s first-ever Super Bowl ad, created and produced by the recently-launched hybrid Committee LA. The San Francisco-based creative team of Jeff Huggins and Andrea Janetos partnered with Committee LA founders directors Frank Samuel, Jeff Reed and Executive Producer Lauren Bayer on the :30 ad entitled “Wix Entrepreneurs.” The spot will appear during the fourth-quarter of Super Bowl XLIX on NBC February 1. Teaser ads featuring Owens and Smith debuted earlier this month on Wix’s YouTube channel, with more to come leading up to the big game. The :30 ad opens with Favre meeting with his agent (played by actor Rex Lee, best known as Lloyd, the long-suffering assistant to agent Ari Gold on HBO’s Entourage) to discuss his next career move. After Rex suggests he start a new business, we cut to a hilarious montage of new businesses founded by fellow former NFL-ers, including Smith’s Double Deuce nightclub, where he shows off the dance moves that won him first-place on “Dancing With The Stars,” and Owen’s ironically-named Humble Pie Bakery, among others. The spot ends with Favre launching Favre & Carve, a gourmet charcuterie (specializing in Cajun sausage, cured meats, and Wisconsin cheeses). In addition to eschewing the traditional ad agency hierarchy, Wix also went the ambitious route by blurring reality with a comprehensive and multi-faceted campaign that essentially launches five distinct businesses. For Committee LA that meant producing a wide range of video assets from six-second Vine videos to regional ads spotlighting businesses like Franco Harris’ wedding planning service called “The Immaculate Reception” and lineman Larry Allen’s car towing service. There’s even a 6-minute viral cooking segment featuring Owens and celebrity chef Matty Matheson cooking a ‘humble’ gold leaf and butterscotch apple pie. Huggins, a 25-year advertising creative whose impressive resume includes stints at agencies Deutsch NY, J. Walter Thompson and Goodby Silverstein & Partners, notes the campaign is incredibly ambitious yet very much rooted in who Wix is as a brand and their core mission to support the entrepreneurial spirit. Samuel explained that creatively, the team began the production process by asking themselves what a new business really needs to get started – a website, local ads, online videos, a social media presence – and then went about creating that content. 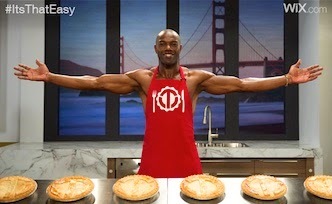 Samuel adds, that online spots for Terrell Owens’ Humble Pie bakery provide info where customers can order actual pies that come with an autographed photo of T.O. To produce all of this challenging content, the Committee LA crew of 22 traveled first to New Orleans to shoot scenes with Favre and Lee, then crisscrossed the country to shoot the other talent, always working under enormous time and schedule constraints.